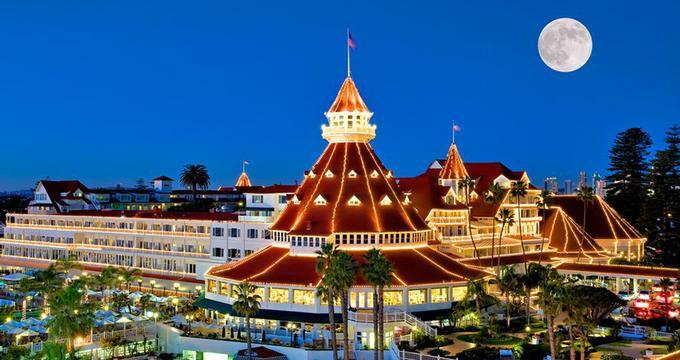 Hotel del Coronado is a beach getaway located on 31-acre oceanfront acres near San Diego, California. The resort is a National Historic Landmark and a recreational paradise for grown-ups and kids alike. If you are looking for active weekend offers, activities at the hotel include golf, sailing, surfing, kayaking, fishing, biking, swimming and tennis. The resort offers specialized programs and fully supervised activities for kids which makes it a great family vacation destination. The 78 guestrooms and suites at Beach Village offer dining and living spaces with fully equipped kitchens and gourmet-quality appliances, fireplaces, plush 400-thread-count bedding, spa-style baths with soaking tubs and spacious ocean-view balconies and private terraces. The spa offers a number of pampering treatments, including Swedish, sports, and Shiatsu massages, and aromatherapy. The beauty salon provides skin care services, haircuts, and make-up application. In addition to the variety of beach activities, guests can hire a personal trainer, workout in the fitness center, join a daily fitness class, or practice Hatha Yoga. One can also learn a new sport, such as surf boarding. The hotel provides board rentals and lessons. There is a beautiful bike trail and bike rentals for all ages. The hotel's Recreation Department organizes the Coronado on Wheels Bike Tour, a two-hour guided tour of historic Coronado. The Boathouse offers rentals and instruction for sailboats, kayaks and fishing. If you are planning a golf vacation, you can reserve tee times at the Golf Course or have the hotel concierge make reservations at any one of the eighty golf courses in the San Diego area. The hotel offers a great variety of activities for kids ages 4 to 12 as a part of its Kidtopia programs. The facility features bright colors, underwater murals and separate beach-themed rooms for crafts and playtime. There's a crazy funhouse mirror and high-tech entertainment stations with computers, movie-time media and a Dance Dance Revolution game. Other activities available at the resort include Teen Vibz for teenagers, Ping Pong, Bocce Ball, Croquet and board games, which are all complimentary. At the pool, you can purchase children's water toys, goggles, sunscreen and other items. Pool towels and chaise lounge chairs are complimentary. The resort offers a number of very different rooms, ranging from Victorian to contemporary. The 381 guest rooms in the Victorian building, a national historic landmark, been restored with traditional Victorian decor. The Victorian category rooms are smaller (measuring from 200 to 289 square feet), and most have no view. The Resort category rooms measure between 290 and 350 square feet and are located primarily in the Towers and Cabana buildings with a few rooms in the Victorian building. Hotel del Coronado also offers larger Premier class rooms and various suites. The resort's fine dining restaurant, 1500 OCEAN, serves classic cuisine combined with innovative interpretations. In addition to the extensive wine list, 1500 OCEAN features an exclusive library wine list, representing selected wineries and vintages from around the world. The resort's seaside restaurant Sheerwater serves coastal cuisine. Because of its service, unique design and giant outdoor fireplaces, Sheerwater is considered one of the finest oceanfront restaurants on the West Coast. Babcock & Story Barserves signature margaritas, tropical drinks, California wines, espressos, and appetizers. Nearby attractions include SeaWorld, San Diego Zoo, Balboa Park, Birch Aquarium at Scripps and Legoland. Plan a romantic trip at the Beach Village at The Del with one of these great packages. The "Romance Package" starts at $875 per night and includes: suite, cottage or villa, $150 dining credit, Private bonfire with champagne and s'mores, breakfast daily and a Personal concierge service. Couples are accommodated in a romantic room with a fireplace and a private terrace or balcony. The "Grown-Up Getaway" is another great choice for a quick weekend break. With rates starting from $680, the package includes: 15% off your stay in a recently refreshed cottage or villa guestroom or suite, $100 resort credit, and free continental breakfast daily. The "Best of San Diego" package starts at $850 per night and includes: Two adult 3-for-1 passes to SeaWorld, the Zoo and Safari Park for five consecutive days, and Complimentary continental breakfast daily. Prices vary by season and availability. The hotel often offers special packages, including family vacation or romantic getaway packages. The closest airport is San Diego Lindbergh International Airport. The resort's shuttle company, Presidential Limousine, can provide transportation to the hotel.